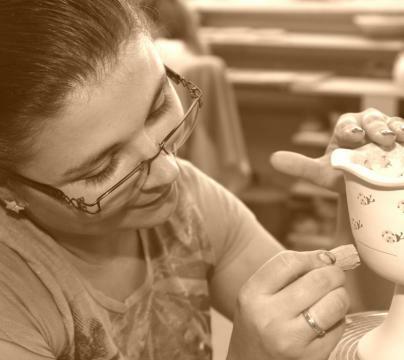 If you have ever wondered about how the famed town of Boleslawiec began producing the exquisite Polish Pottery of today, you need to start several thousand ago. 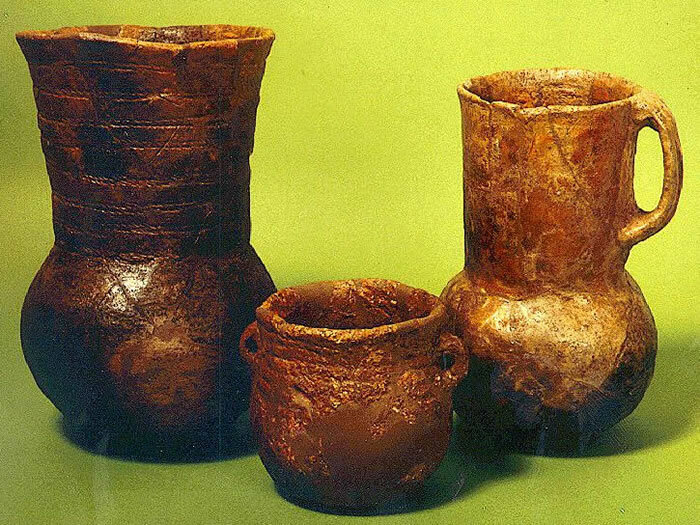 The remarkable pottery created by artisans in Boleslawiec has roots dating back to at least 6,000 B.C. 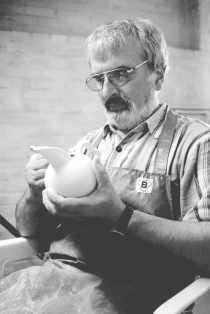 The story of Boleslawiec Polish Pottery is both an interesting and triumphant one. The potters of this town and region have had to overcome immense setbacks, but they have always prevailed and exist as one of the most famous producers of pottery in the world. Archaeologists have found evidence of earlier cultures settled in this area, cultures such as the Linear Band Ware Culture, but we will begin with the Stoke-Ornamented Ware Culture, (also called Stichbandkeramik in German, or STK for short). 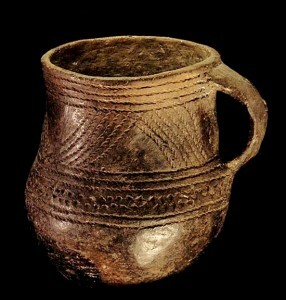 Pottery found from this culture dates back over 7,000 years. Though they were spread throughout Germany, Poland, Austria, and the Czech Republic, STK culture was centered within the Silesia Region in Poland (just like Boleslawiec!). STK earned its name from the German archaeologists studying their pottery. These vessels were generally pear shaped with a large band around the top of the vessel. The name derives from the strokes used to decorate the pots. The strokes were used to form a pattern of contiguous A’s around the vessel. Evidence also shows that the pottery from this region was more advanced than nearby cultures of the time. Additionally, the surfaces of these vessels were shiny, indicating that they may have been using some type of glaze on these pots when they were fired. The structure found at Gosek. 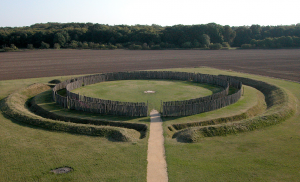 A really interesting side note about the STK culture is that there was a structure found at Gosek (located south of Berlin) that could be described as a wooden version of Stonehenge. 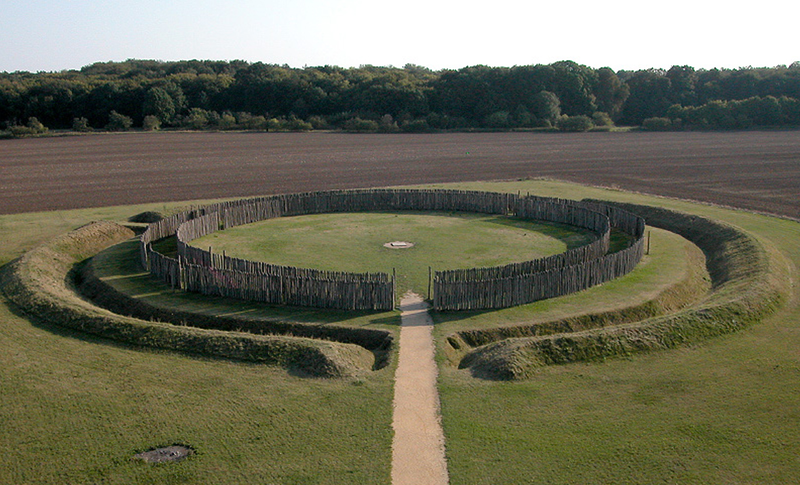 It was likely used to observe the course of the sun in order to calculate a lunar calendar. Evidence of fire, human and animal remains as well as a decapitated skeleton can be found at this structure suggesting sacrifices (both human and animal) may have taken place here! 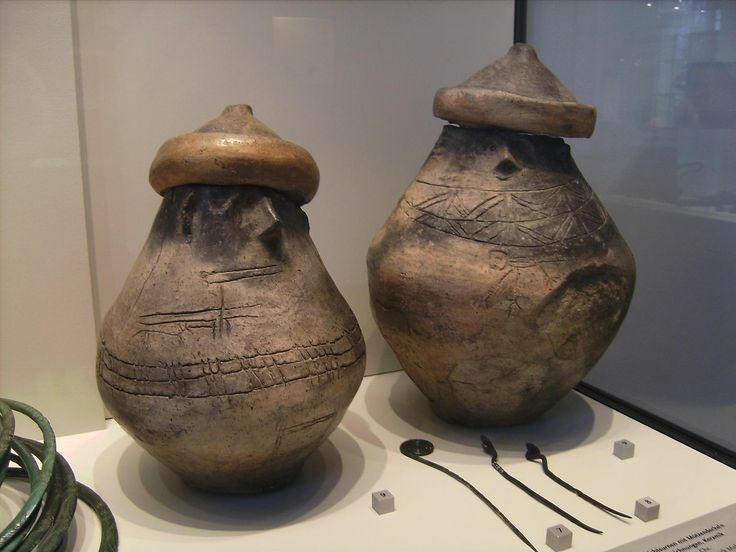 Following the STK culture was the Corded Ware Culture living from around 3200 BC to around 1800 BC and spanning across parts of Germany and all of what is present-day Poland. 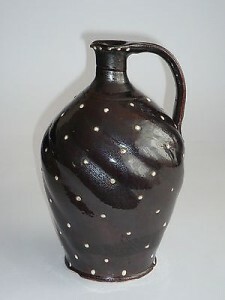 The pottery produced by this culture was tan or brown and decorated with bands of dots around the surface. 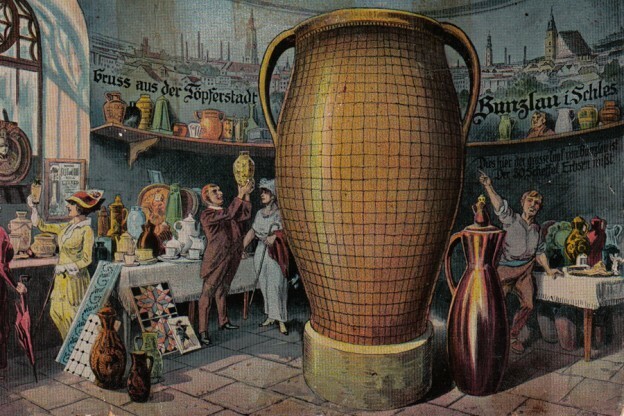 The vessels were either beaker-shaped or large round pots called Amphoras. Around 500 BC, during the Iron Age, came the Pomerelian Face Urn Culture. Their pottery featured male faces around the neck of the vessel and a bulbous base representing the human torso. These burial urns had hat-lids decorated with solar motifs. In many cases, small bronze earrings were placed on the pottery. Each urn had separate facial characteristics and there was often a hunting scene or even a chariot race painted on each vessel. Following the dark ages, pottery from the early middle ages has been found in Boleslawiec dating from around 600 AD when the town was called Boleslawice. Boleslawiec itself was established in 1202, it was then a German town named Bunslau (this is why the pottery is sometimes referred to as Bunslau pottery). 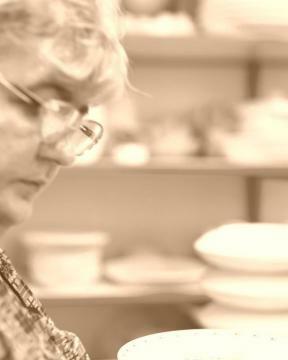 Boleslawiec is still known today for its excellent naturally found stoneware. The people of the middle ages were privy to this and historical records from 1380 speak of a Potter from Boleslawiec. Unfortunately, in 1492 the town was nearly decimated by the Hussite Wars. Thankfully, the town was rebuilt and the first pottery Guild was formed in 1511. Pottery dating from this era contains the signatures of the master craftsmen who created them. This may be viewed as a precursor to Unikat pieces. Boleslawiec was one again nearly destroyed, this time by the Thirty Year War lasting from 1618 to 1648. The town went from 600 residents to 80. Once again, Boleslawiec was rebuilt by its potters and began making pottery for royalty around 1650, this reputation for excellent pottery spread throughout Europe in the 1700s. In 1753, potters of the area built a 6 foot tall clay pot which became the symbol for Boleslawiec, a replica of this pot still rests in the town square today. 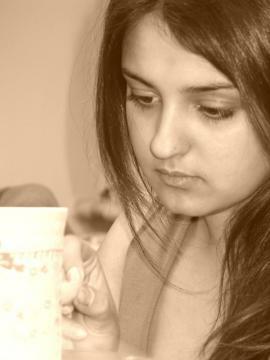 At this time, the pottery produced in Boleslawiec was made of a brown clay body called earthenware and covered with brown glaze. 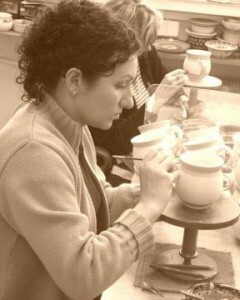 Additionally, all of the pottery was created on the potter’s wheel. This is much different than the pottery produced today. The pottery made in modern Boleslawiec is in large part a result of the efforts of Johann Gottlieb Altman. 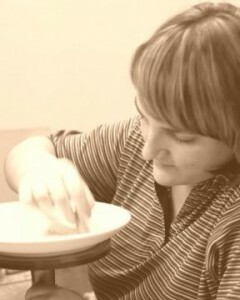 He introduced reusable molds to the region and began using a different clay body, known as stoneware. Stoneware is white like porcelain and far more durable than earthenware. Also, he porbably saved lives by introducing glazes made with the element Feldspar rather than continuing to use glazes made with lead. Potters wanted to attract the favour of royalty and nobility to ensure they would have continued income, this lead to the famous peacock pattern as well as the royal blue color that Polish Pottery is most widely known for. Male peacocks have historically been a symbol of wealth and royalty in Europe, because of this, ceramic artists began basing their design motifs on the patterning of the male peacock, specifically their beautiful tails. The swirling designs found in this pattern are a direct correlation to the peacock’s tail. Boleslawiec artists formed the Professional School of Ceramics in 1897. The area was so famous for its pottery that Dr. Wilhelm Pukall left his position as technical director for the Royal Manufacture of Porcelain in Berlin to become the school’s first headmaster. Unfortunately, war once again tore through Boleslawiec during WWI. After the war ended in 1936, a cooperative consisting of six guilds was formed. This, however, was a step farther away from the pottery produced in Boleslawiec today. Bunzlauer Braunzeug, as the cooperative was called, was named for the town of Boleslawiec (the German town of Bunzlauer, the alternative name for Boleslawiec) and the color brown. The pottery emerging at this time was typical of the pottery created before Johann Gottlieb Altman came along and revolutionized the pottery of this region. It was brown with white decorations. This continued until WWII. Boleslawiec is only 50 miles from Germany and 80% of the manufacturers were destroyed during WWII. In 1950, however, the State Committee of Economic Planning commissioned the Centre of the Folk and Artistic Industry to rebuild the ceramics industry of Boleslawiec. There was a closed plant that was still standing after the war, called Julius Paul and Son. This is where Ceramika Artystyczna (Artistic Ceramics) started the first post-war factory making Boleslawiec Polish Pottery. At first they only made vases, but by the next year they were stamping and hand-painting dinnerware, and by 1954 they were a full cooperative with 45 employees. 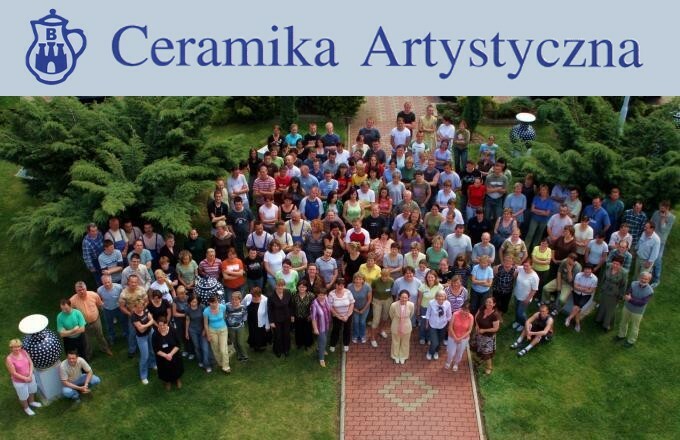 In 2000, Ceramika Artystyczna had over 230 employees and offered hundreds of patterns. This paved the way for the numerous other family businesses and cooperatives that exist in Boleslaweic today. 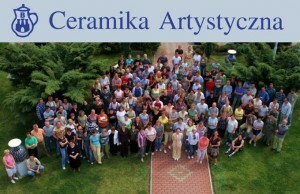 Ceramika Artystyczna’s artists in 2000. The history of Boleslawiec is truly incredible. To know what it took for the artists of Boleslawiec to exist today is fascinating. The ceramic artists of this region have proven to be strong-willed, resilient, and guided by what seems to be a desire and a calling to create beauty. Owning a piece of Polish Pottery is like owning a piece of history and perseverance; a piece of triumph over devastation, and of course, a piece of exquisite beauty. 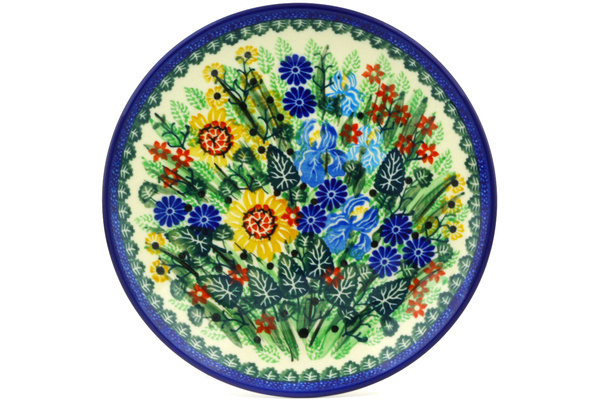 You can find Boleslawiec Stoneware & Dinnerware at Polmedia Polish Pottery. This entry was posted in History of Polish pottery and tagged Bolelawiec Polish Pottery, Boleslweic Pottery, Ceramics, Clay, Dinnerware, handpainted stoneware, high-quality stoneware, History of Polish pottery, Poland, Polish, Polish stoneware, Polmedia Polish Pottery, Pottery, Stoneware, Where to find Polish stoneware on May 11, 2015 by Sara. Born in 1937 in Bełżec. 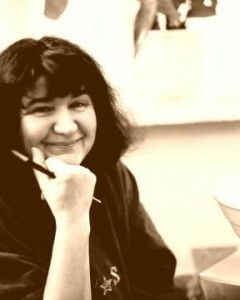 Studied at the Academy of Fine Arts in Wrocław (class of Professor Julia Kotarbińska). * Ambiente International Fair, Frankfurt, 1st Prize for a wedding table arrangement 1999. 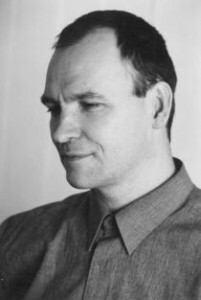 His works are in the National Museums in Warsaw, Wroclaw, Szczecin, Poznań, Gdansk and Bielsko-Biala, Ceramics Museum in Boleslawiec, Museum of Upper Silesia in Bytom, Museum in Gliwice, District Museum in Jelenia Gora, Museum of Copper in Legnica, Everson Museum in Syracuse (USA). 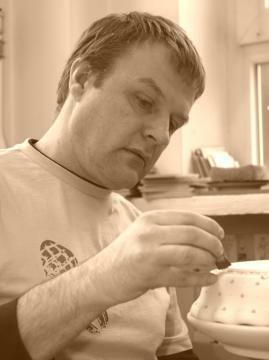 Born in 1962 in Bolesławiec. Graduated from Academy of Arts in Wrocław in prof. Feliks Kocianowski’s studio. 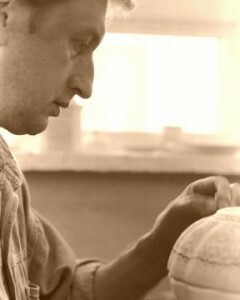 He has been connected with the Artistic handicraft Cooperative “Artistic Ceramics and Pottery” since 1991. 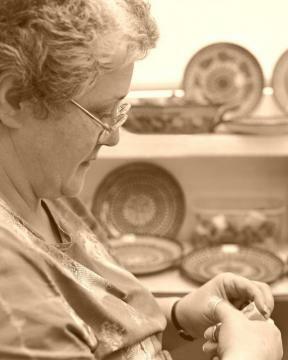 The artist has been connected with the Artistic Handicraft Cooperative “Artistic Ceramics and Pottery” since 1970. Since 1992 she has been a pattern designer. 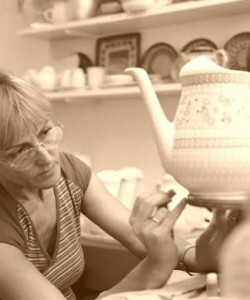 The artist has been connected with the Artistic Handicraft Cooperative “Artistic Ceramics and Pottery” since 1988. Since 1994 she has been a pattern designer. 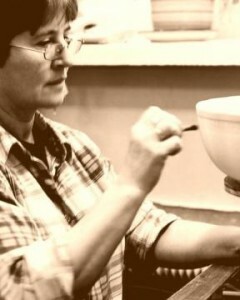 The artist has been connected with the Artistic Handicraft Cooperative “Artistic Ceramics and Pottery” since 1986. Since 1994 he has been a pattern designer. 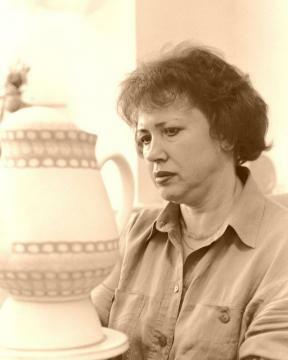 The artist has been connected with the Artistic Handicraft Cooperative “Artistic Ceramics and Pottery” since 1981. Since 1994 she has been a pattern designer. The artist has been connected with the Artistic Handicraft Cooperative “Artistic Ceramics and Pottery” since 1983. A pattern designer since 1992. 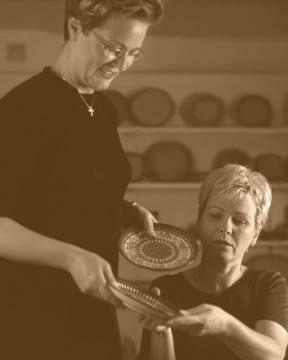 The artist has been connected with the Artistic Handicraft Cooperative “Artistic Ceramics and Pottery” since 1990. Since 1995 she has been a pattern designer. The artist has been connected with the Artistic Handicraft Cooperative “Artistic Ceramics and Pottery” since 1981. A pattern designer since 1993. The artist has been connected with the Artistic Handicraft Cooperative “Artistic Ceramics and Pottery” slice 1983. 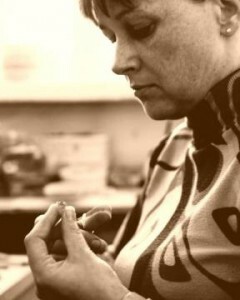 Since 1995 she has been a pattern designer. The artist has been connected with the Artistic Handicraft Cooperative “Artistic Ceramics and Pottery” since 1989. Since 1997 she has been a pattern designer. 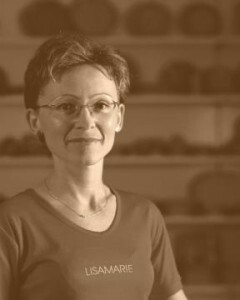 The artist has been connected with the Artistic Handicraft Cooperative “Artistic Ceramics and Pottery” since 1993, whereas since 1997 she has been a pat-tern designer. 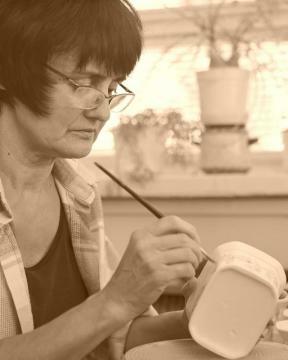 The artist has been connected with the Artistic Handicraft Cooperative “Artistic Ceramics and Pottery” since 1980, whereas since 1994 she has been a pat-tern designer. 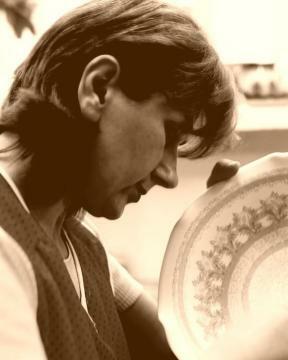 The artist has been connected with the Artistic Handicraft Cooperative “Artistic Ceramics and Pottery” since 1989, whereas since 1994 she has been a pattern designer. The artist has been connected with the Artistic Handicraft Cooperative “Artistic Ceramics and Pottery” since 1991. Since 1997 she has been a pattern designer. 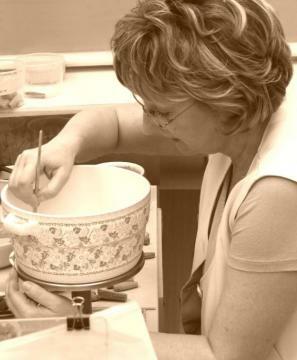 The artist has been connected with the Artistic Handicraft Cooperative “Artistic Ceramics and Pottery” since 1990, whereas since 1997 she has been a pattern designer. 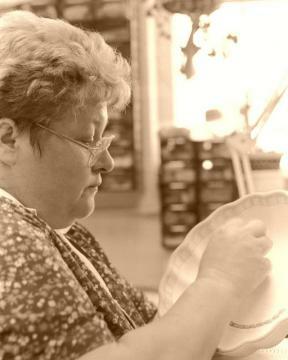 The artist has been connected with the Artistic Handicraft Cooperative “Artistic Ceramics and Pottery” since 1995, whereas since 1997 she has been a pattern designer. 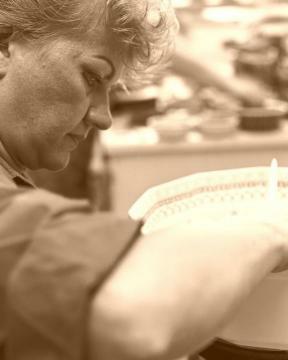 The artist has been connected with the Artistic Handicraft Cooperative “Artistic Ceramics and Pottery” since 1989. A pattern designer since 2002. 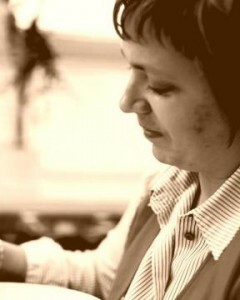 The artist has been connected with the Artistic Handicraft Cooperative “Artistic Ceramics and Pottery” since 1998. Since 2002 she has been a pattern designer. 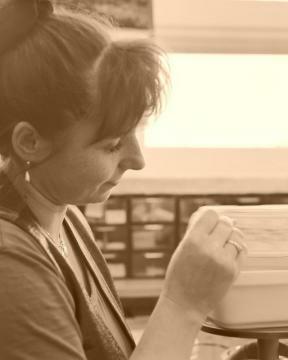 The artist has been connected with the Artistic Handicraft Cooperative “Artistic Ceramics and Pottery” since 1997, whereas since 2003 she has been a pattern designer. The artist has been connected with the Artistic Handicraft Cooperative “Artistic Ceramics and Pottery” since 1990. A pattern designer since 2002. The artist has been connected with the Artistic Handicraft Cooperative “Artistic Ceramics and Pottery” since 1987, whereas since 2002 she has been a pattern designer. The artist has been connected with the Artistic Handicraft Cooperative “Artistic Ceramics and Pottery” since 1996. Since 2001 she has been a pattern designer. The artist has been connected with the Artistic Handicraft Cooperative “Artistic Ceramics and Pottery” since 2001. Since 2003 she has been a pattern designer. 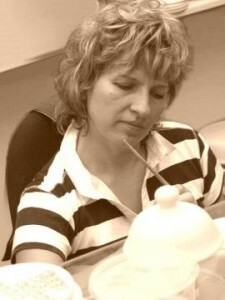 The artist has been connected with the Artistic Handicraft Cooperative “Artistic Ceramics and Pottery” since 1991. Since 1998 she has been a pattern designer. 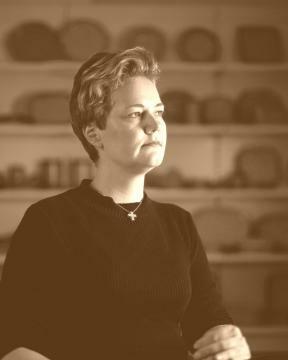 The artist has been connected with the Artistic Handicraft Cooperative “Artistic Ceramics and Pottery” since 1996. Since 2002 she has been a pattern designer. 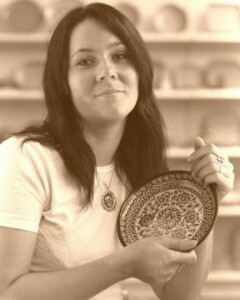 The artist has been connected with the Artistic Handicraft Cooperative “Artistic Ceramics and Pottery” since 2004. Since 2005 she has been a pattern designer. 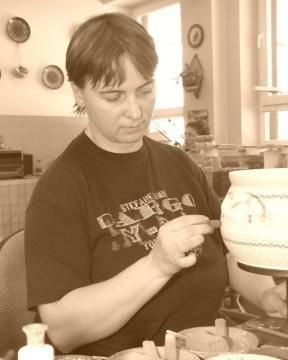 The artist has been connected with the Artistic Handicraft Cooperative “Artistic Ceramics and Pottery” since 1994. Since 2005 she has been a pattern designer. “Production and unique decoration designing is an adventure. 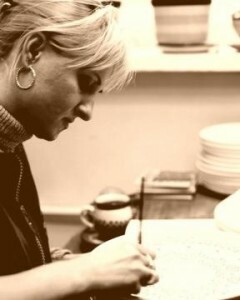 The artist has been connected with the Artistic Handicraft Cooperative “Artistic Ceramics and Pottery” since 2001. Since 2010 she has been a pattern designer. “My desire is to create a beautiful and aesthetically appealing decoration using the available palette of colors and my original design stamps. The artist has been connected with the Artistic Handicraft Cooperative “Artistic Ceramics and Pottery” since 1997. Since 2010 he has been a pattern designer. This entry was posted in History of Polish pottery, How Polish pottery is made and tagged Boleslawiec, handpainted stoneware, History of Polish pottery, Polish pottery, stamping technique on September 23, 2011 by Monika. 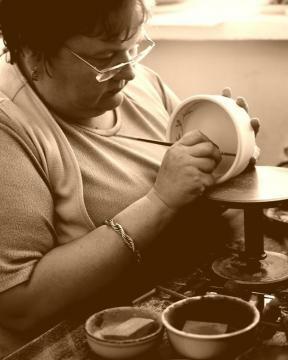 The Boleslawiec region has a long history of pottery making which dates back to the Middle Ages, due to the presence of rich clay deposits in the area. From this clay, which is naturally high in feldspar & silicon, artisans have long been able to make pottery with a hard, sintered surface that is acid and fire-proof and which burns to a white, or bisque, color. By overlaying this bisque with incredibly colorful designs that skilled artists have uniquely developed over many decades, this sturdy dinnerware is transformed into the most luxuriously beautiful, high-quality stoneware anywhere. While early seventeenth century pottery from the Boleslawiec area was much different than today’s modern stoneware, certain similarities have carried through to modern times. Certain shapes, like beer steins, pickling crocks, and pitchers are as useful today as they were then. The weight of thsi stoneware separates it from most modern dinnerware today and conveys an “of-the-ages” earthen quality. While shapes are now made by using forms, thanks to Johann Gottlieb Altmann, and you’ll no longer find grooving from maker’s hands, most shapes have retained a rounded, thick form reminiscent of the days when the pottery was hand-thrown and formed on a potter’s wheel. When the mostly white clay of the Boleslawiec region became the most popular for use in Polish pottery, pastoral scenes were at first handpainted in classicist style, similar to the style of the finely decorated porcelain of that day. Stamped-on designs, as are in use today, came into style later on and were first applied using various stamps including cut potatoes, hare’s paws, or scraps of fabric. Now, artists fashion their own stamp designs from small sponges and apply by hand a variety of colors with detailed stamping and brushstrokes. 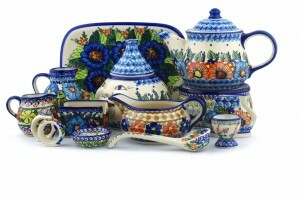 Polish pottery is now widely known for these intricately detailed designs that are truly one-of-a-kind. Polish stoneware is purchased and collected by many today who value its quality craftsmanship — a painstaking detail in design and uniformity of shapes and patterns. 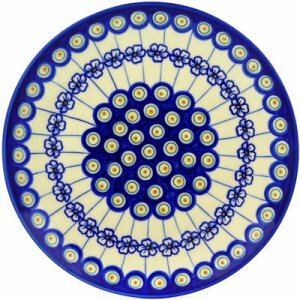 Many large and small producers now compete in Boleslawiec and new designs are always emerging while traditional pieces continue to be loved by Polish pottery consumers. More than just a folk art, Polish pottery is a product with mass appeal — a product for those with a taste and appreciation for beautiful, high quality products. Perhaps you’re an enthusiast of Polish stoneware? 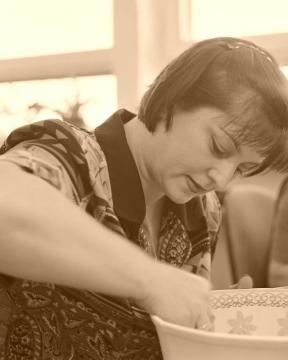 If so, what was your first piece of Polish pottery and what do you love most about it? This entry was posted in History of Polish pottery and tagged Boleslawiec, handpainted stoneware, History of Polish pottery, stamping technique on July 18, 2011 by artisanimports.